What is Li-ion (Lithium-ion) battery? In the world of Lithium Rechargeable Batteries, guides and descriptions below will come in handy and expand knowledge base and horizons for those wandering around and trying to navigate themselves through the vast number of abbreviations (e.g. li-ion, 18650, 26650, 14500 ...), and terms not familiar with — related to these unique and powerful Li-ion must haves, used in many high drain-low capacity, and low drain-high capacity applications. Lithium-ion Rechargeable Batteries are a special breed packed with amazingly powerful energy that provides dramatically increased longevity, low self-discharge, efficiency and optimized usage time. When you think of batteries you might first think of what you’ve been faced with most in the store aisles. First come to mind widely used AA or AAA size batteries; however, AA or AAA are old technology, and can’t match the power of Lithium-ion Batteries. Lithium is a soft, silver-white metal. Lithium is the lightest, and the least dense solid element which is so light that floats on water (less dense than water). Lithium never occurs freely in nature. Instead, it typically can be found in the form of ionic compounds. Belonging to a group of alkali metals, lithium is subsequently highly reactive and flammable. Advantage of these characteristics also gives it tremendous electrochemical potential evident in very high energy and power densities. What is li-ion battery chemistry (Chemical Structure)? Chemistry is the main force behind the power of li-ion batteries. Cells that batteries contain are electrochemical units containing electrodes, separators, and electrolytes (in most cases protected with a small electronic circuit). When going into more specific details of chemical composition of batteries, you will discover that the typical Lithium-ion cells use graphite and other carbon materials for its anodes. Also, their cathodes are Cobalt-based Lithium Cobalt dioxide LiCoO2 or Lithium Manganese LiMn2O4. On the other hand, lithium salts, such as LiPF6, LiBF4 or LiClO4, in an organic solvent, are the basis for the electrolytes. This is only a part of the answer to the question, what the chemicals are used in li-ion batteries. 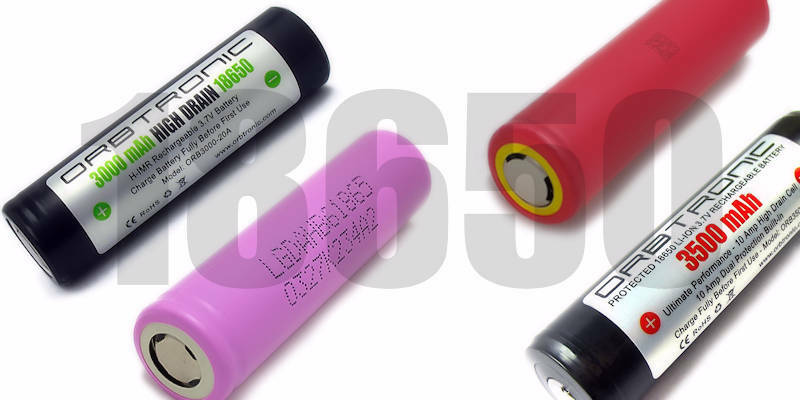 Most popular, and widely used is 18650 battery.More details to follow on our blog. There is a diverse and widespread use of lithium-ion rechargeable batteries. Starting from high popularity in consumer portable electronics (laptops, tablets, cell phones, cameras, torches, power tools etc.) to a rising popularity among battery operated vehicles (aircraft, electric cars, golf cars, hybrid vehicles, electric wheelchairs etc.) demand for Lithium rechargeable batteries spans aerospace technologies as well (radio-controlled models, model aircraft, the Mars Curiosity rover etc.). Many less practical chemical variations of different batteries have been introduced prior to being developed into Lithium-based rechargeable batteries. Chemical dilemmas and obstacles of 1970’s were resolved by replacing metallic lithium with only lithium compounds which were capable of accepting and releasing lithium ions. Research and development has continued throughout the years reaching some major milestones in 1980’s further perfecting electrochemical interaction and design into 1990’s first Li-ion battery. Nowadays we see the results in its peak of capacity and performance on Lithium-based rechargeable batteries market. With advancements in research and development and contributions to tremendous upgrades and improvements to quality and performance of Lithium rechargeable batteries, the application and the usage of this energy packed power cells has gained widespread acceptance and likewise consumption. High (fully charged 4.2V and nominal 3.6V or 3.7V) voltage allows Li-ion battery packs with only one cell. That finally makes our job easier: lower number of cells needed, and much less interconnections between lithium-ion cells for high voltage rechargeable battery packs. Specifically, high cell voltage of 3.6 V (fully charged 4.2V) means that one Lithium-ion battery cell can replace three NiCd batteries (Nickel anode-Cadmium cathode) or NiMH (Nickel–metal Hydride battery) cells whose voltage is 1.2 V.
Lithium based batteries have very high energy density — with increasing potential for even higher capacities. By the end of 2017 we will probably see new Panasonic 3800mAh 18650 cell. Almost non-existent, extremely low self-discharge rate. Pre-charged to 3.7V (long term storage charge level) battery can stay at that discharge level for up to five years. Comparing to Ni-Cd and NiMH self-discharge is less than 50%. Low Maintenance — no scheduled refreshing/cycling (charging, discharging to refresh battery) is needed to extend battery life. No memory effects. Li-ion cells do not require costly maintenance to verify their high performance. For example Ni-Cd cells need periodic "refreshing" (discharge-charge cycling) to make sure no memory effect happen. Rechargeable li-ion batteries are lightweight. Li-ion battery can be custom made for high capacity, or high discharge rate. Can be discharged at very high C rate (High discharge rate - High Drain). 18650 battery is most popular rechargeable 3.7V li-ion size today. #What is a lithium ion battery?